Young Jacob grows up in a comfortable Jewish household with a doting mother and a father who is often away on business. He has two older sisters, one younger sister, and a brother who dies in early childhood. Dinezon enters the yeshiva at age twelve. Dinezon’s father dies and he is sent to live with an uncle in the city of Mohilev (Mogilev) near the Dnieper River. Dinezon is enrolled in a prestigious Jewish school that embraces the spirit of the Haskalah (Jewish Enlightenment). He learns Russian, German, mathematics, world history, and science. At sixteen, Dinezon lives and studies with Sh. Zuckerman, whose library includes Enlightenment literature in Hebrew. Dinezon enters the employ of a wealthy and prominent family in Mohilev named Horowitz. Starting as a Hebrew tutor, he is soon promoted to bookkeeper, and then to manager of the family business. He becomes a trusted member of the Horowitz household and Bodana Horowitz, the family matriarch, becomes a second mother to him. The Horowitz home is a gathering place for disaffected young people struggling to break away from the restrictive customs of traditional Jewish religious life, including an insular worldview, rigid gender roles, and arranged marriages. Here Dinezon finds poignant and emotional material for his future novels. During this period, Dinezon falls in love with the Horowitz’s only daughter who he is tutoring. He escorts her in travels to foreign lands to study music, yet is never able to reveal his true feelings. The relationship ends sadly when at the request of the family, Dinezon must travel to Vilne to make arrangements for the girl’s marriage to another man. Heading to Vilne with an introduction from Bodana Horowitz to her sister Devorah Romm, head of the famed Widow and Brothers Romm publishing company, Dinezon meets the renowned Yiddish writer, Isaac Meyer Dik, who assists him with the sale of his first novel, Beoven avos (For the Sins of the Fathers) for twenty-three rubles. Due to censorship, the manuscript is never published and ultimately lost. To replace the censored book, the Widow and Brothers Romm publishes Dinezon’s Ha’neahovim vha’neimim, oder, Der shvartser yungermantshik (The Beloved and Pleasing, or, The Dark Young Man). This same year Dinezon moves to Moscow where he works at a tea company for one of his relatives. While there he learns that The Dark Young Man has been published. The novel quickly becomes a great sensation with the first ten thousand copies selling out quickly and several reprints to follow. About this first book, it is said that for many years the names of the characters were household words as though people actually knew them. Despite the great success of The Dark Young Man with the general public, Dinezon is disappointed by the negative critical response the novel receives from the Enlightenment press because it is written in Yiddish and not Hebrew. At the time, Yiddish was considered a lowly language only worthy of the home, street, and marketplace. Hebrew was the elevated language of the religious scholar and enlightened intellectual. 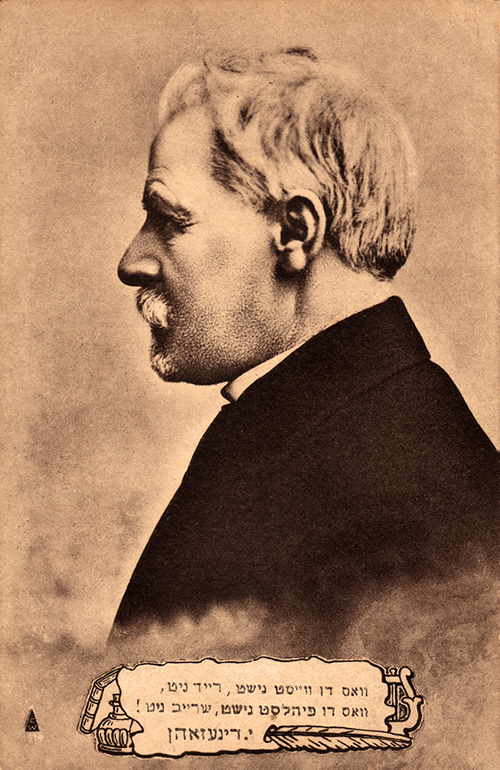 Dinezon was devastated by the criticism leveled at him for writing in the disdained “zhargon” (jargon). Dinezon is also distressed by the sudden appearance of opportunistic Yiddish writers and their shamefully imitative works. In response, although he continues to write, he ceases to publish another Yiddish novel for thirteen years. Dinezon settles in Warsaw to be closer to his sister and her family. His small attic apartment at Dzielna No. 15 becomes a focal point for the city’s Jewish literary circle, and Dinezon becomes a mentor and advisor to fledgling Yiddish writers. While visiting Kiev, Dinezon is arrested and jailed for several hours until his identity is verified and papers have been approved. This same year, Sholem Aleichem comes to Dinezon’s small apartment to discuss his plan to publish a Jewish literary anthology. Also present are David Frishman and Samuel Tsitron. Sholem Aleichem’s goal, he says, is to elevate Yiddish literature. Dinezon contributes advice and a short story, “Go Eat Kreplach,” to Sholem Aleichem’s new venture. 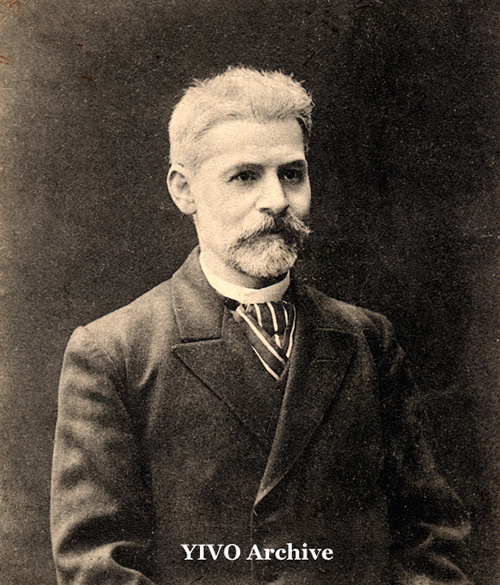 Also included in the first volume is a long poem by I. L. Peretz entitled, “Monish.” Peretz, whose law practice had collapsed following his disbarment by the Czarist authorities, was just beginning to write seriously in Yiddish. 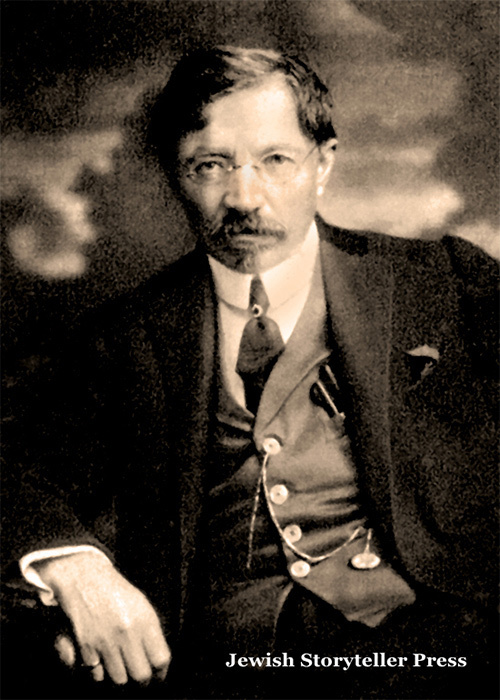 Although Sholem Aleichem publishes the poem, he makes critical edits without first informing Peretz. This leads to a feud that lasts for many years. When Dinezon reads “Monish” in Sholem Aleichem’s Di yidishe folks-bibliotek (The Jewish People’s Library), he corresponds with Peretz to express his enthusiasm for Peretz’s writing. Peretz moves to Warsaw where he finally meets Dinezon. They become inseparable friends. Perhaps through Peretz’s encouragement, Dinezon begins to publish again. His book Even negef, oder a shtein in veg (A Stumbling Block in the Path) is published in Vilna. Dinezon intends Bakante bilder to be the first in a series of books in a “penny library” that will bring Jewish readers stories of substance in Yiddish. This same year Sholem Aleichem must cease publication of Di yidishe folks-bibliotek after suffering major losses in a Russian stock market crash. Dinezon’s book, Hershele, is published. In partnership, Dinezon and Peretz begin publishing their own literary anthology, Di yidishe bibliotek (The Jewish Library), which runs until 1894. The name infuriates Sholem Aleichem. With anti-Semitism growing in Russia and Russian-controlled lands and increasing deportments of Jews to the Pale of Settlement, Dinezon and Peretz make plans to settle in Argentina where thousands of Eastern European Jews are emigrating. Their intention is to start a daily Jewish newspaper, but their plans fall through. Peretz and Dinezon begin publishing Yontef bletlekh (Holiday Pages) to creatively get around the Czarist ban on Jewish newspapers. Between 1894 and 1896 they publish seventeen issues. Dinezon writes an angry article that is critical of the German historian and biblical scholar Henrich Graetz for refusing to allow his monumental history of the Jews to be translated into Yiddish. Dinezon’s response is a powerful defense of Russian Jewry and the Yiddish language. Dinezon’s book, Yosele, is published in Warsaw. 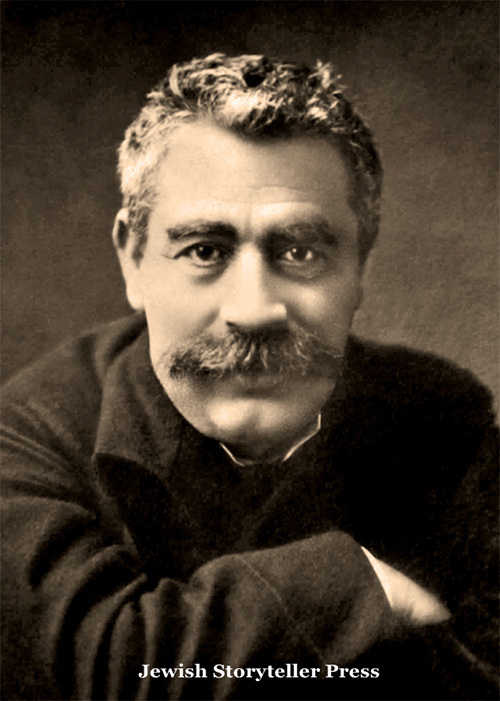 Peretz is arrested while speaking at a Jewish labor workers’ meeting and is imprisoned for three months in the Tenth Pavilion of the Warsaw Citadel. When Peretz is released he is seriously malnourished and ill.
Dinezon spearheads a three-day celebration in Warsaw to celebrate I. L. Peretz’s fiftieth birthday and twenty-fifth year as a writer. To celebrate the event, Dinezon collects, edits, and publishes a volume of Peretz’s collected works. During the celebration, a delegation from the Arbeter Bund (The Jewish Workers Union) presents Peretz with a written proclamation and gift: a book of Peretz’s stories that has been used by Jewish political prisoners to send secret messages to each other in the Warsaw Citadel. Peretz keeps the book as a prized possession, but Dinezon burns the proclamation to destroy any evidence of Peretz’s association with the outlawed Jewish workers’ party. 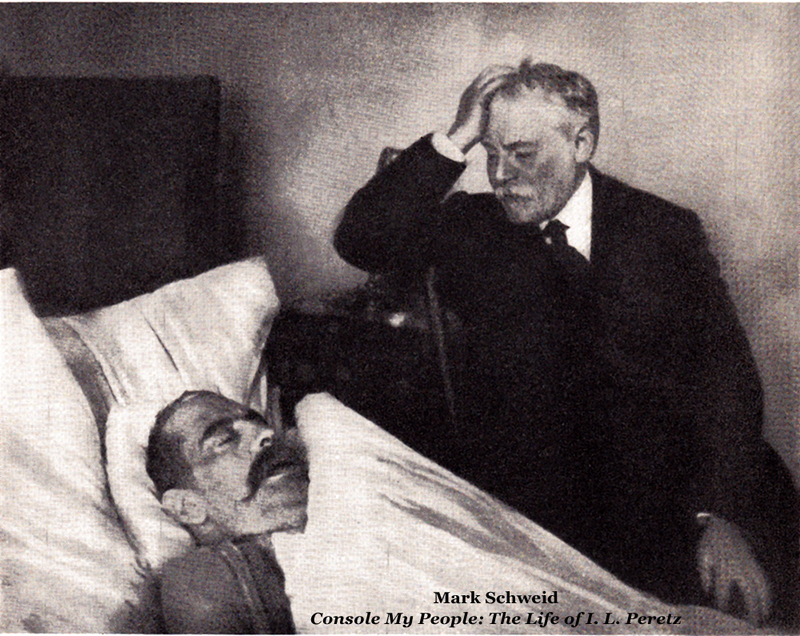 Peretz suffers a near-fatal heart attack and is sent to the resort town of Marienbad, Germany to recuperate. 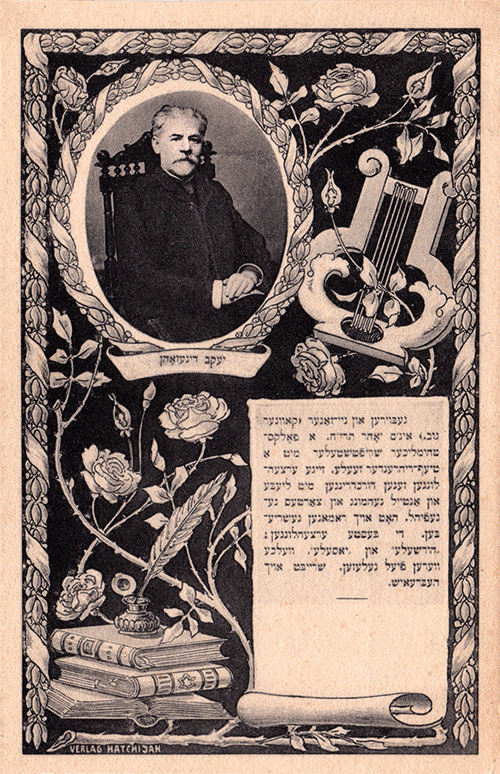 Dinezon continues to provide stories to Yiddish newspapers. His novella, Alter, appears in a supplement to Der fraynd (The Friend). 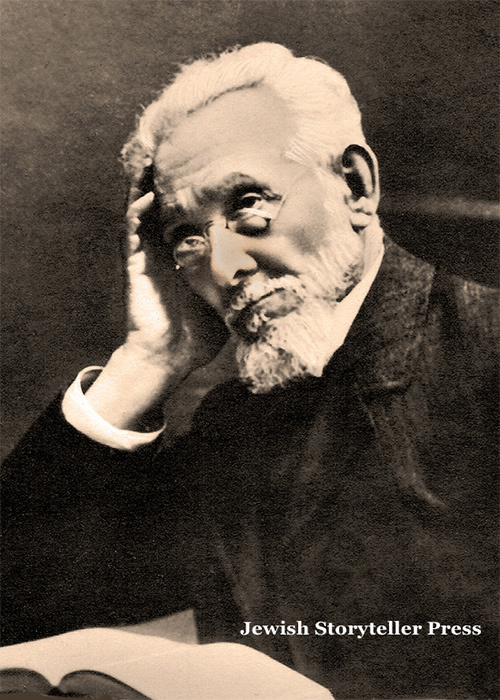 The Czarist government lifts the ban against Yiddish theatre. 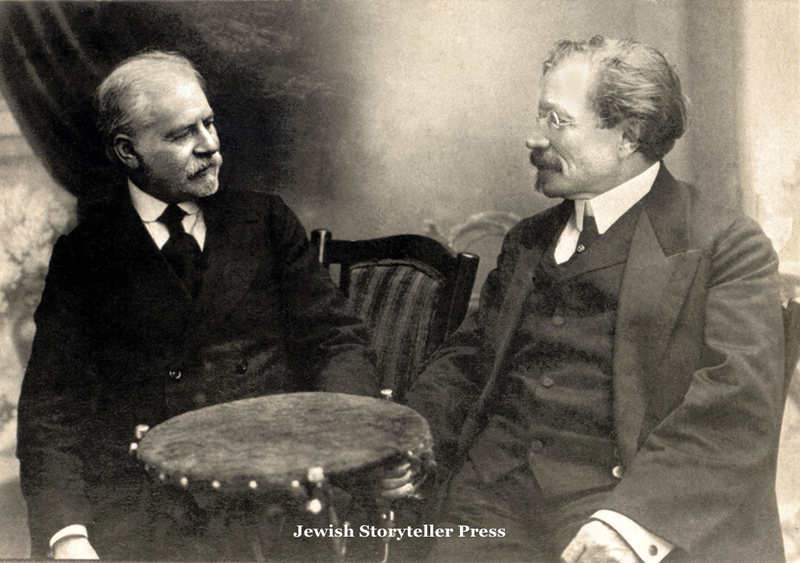 Peretz begins writing plays and Dinezon works to bring Yiddish theatre to Warsaw. Dinezon’s Der krizis (The Crisis: A Story of the Lives of Merchants) is published. Dinezon is invited to America by Johan Paley, the editor of the New York Yiddish newspaper, the Jewish Daily News. Dinezon declines the offer while Warsaw’s Jews are still suffering under Russian oppression in the aftermath of the failed Revolution of 1905. Peretz and Dinezon sign the invitation urging participation in the “Conference for the Yiddish Language” that is held in Czernowitz. Though Dinezon does not attend, Peretz addresses the conference, which seeks to elevate Yiddish to a modern, national language for the Jewish people. The First World War begins. Dinezon again partners with Peretz to help found the Home for Jewish Children, an orphanage to care for the many displaced children arriving in Warsaw from the Russian-German war zone. 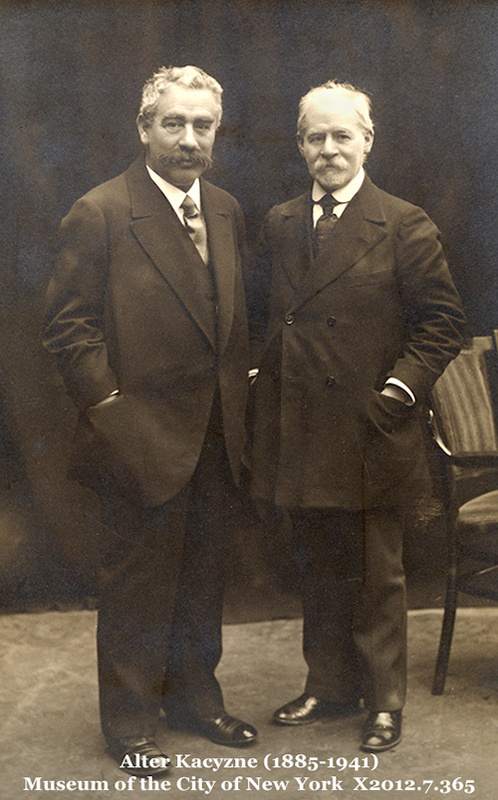 In Dinezon’s Warsaw apartment, Sholem Aleichem and Peretz finally end their feud and make plans to conduct a lecture tour in America. On April 3rd, during Passover, Peretz dies of a heart attack in Warsaw. Dinezon sits as a shomer (watchman) until his friend’s body is removed from the apartment. One hundred thousand mourners turn out for Peretz’s funeral. With Peretz gone, Dinezon turns his attention and support to the Yiddish secular schools’ movement in Poland. On May 13th, Sholem Aleichem dies in America. Over one hundred and fifty thousand mourners line the streets of New York City for his funeral. In the same year as the Russian Revolution, Dinezon’s friend Sholem Abramovitsh dies in Odessa. On August 29, surrounded by family and friends, Jacob Dinezon dies in his Warsaw apartment at Karmelica 29. In a show of solidarity, Jewish mourners from all walks of life come out in the tens of thousands to express their grief on the day of his funeral. His final wish is fulfilled when he is buried beside his friend Peretz in the Okopowa Street Jewish Cemetery.